We had earlier reported that the star couple Genelia D’Souza and Ritesh Deshmuk have been blessed with a baby boy on November 25th, 2014. It looks like they have picked a name for their cute bundle of joy. We hear that Genelia and Ritesh have named their son Riaan. An excited Genelia tweeted, “Blessed to have the entire family under one roof- for the 'Barsa' (naming ceremony) of my lil one. Our Son 'RIAAN RITEISH DESHMUKH'". 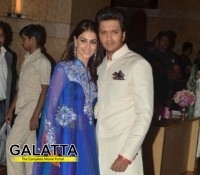 Genelia and Ritesh tied the knot in 2012 after dating for over 10 years.